People have come to believe that good intentions are solutions to problems…and they are not. The world needs more people who commit to getting things done and fewer people who are content to try. 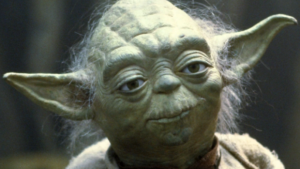 Yoda, a character and a legendary Jedi Master in the Star Wars movies, was stronger than most in his connection with the Force. Small in size but wise and powerful, Yoda trained Jedi Knights for over 800 years in using the Force. The Force, a power greater than ourselves, could be accessed by mortals to do extraordinary, supernatural feats. We can learn much from Master Yoda! So what does this have to do with a little boy? My neighbor’s car has a decal on the right rear quarter-panel. 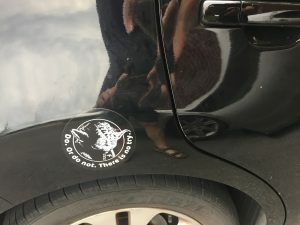 The decal contains a picture of Yoda, and a quote from reads, “Do. Or do not. There is no try.” The dad applied the sticker to help him deal with a problem he was having with his son. My neighbor’s five-year old argued with his dad about getting in his car seat. As a result of the conversation, the dad put the sticker on the car, because the little boy loves Star Wars and Yoda. Problem solved. The little boy learned he could get in his car-seat, and do it all by himself! Unfortunately, adults use “I’ll try” when confronting a big goal or challenges. Saying will try gives us an excuse if we fail!. “I tried!, we say.